Human protothecosis is a rare infection caused by members of genus Prototheca. The occurrence of protothecosis can be local or disseminated; the latter being more common in immunosuppressed patients. The skin is most commonly involved, resulting from primary inoculation through a wound or abrasion. It is a rare disease, with only 117 cases reported worldwide till date. Here we report the case of a 14 year old boy with localized cutaneous protothecosis presenting with eczematous lesions over arms and legs. Here we report the case of a 14 year old boy with localized cutaneous protothecosis presenting with eczematous lesions over arms and legs. 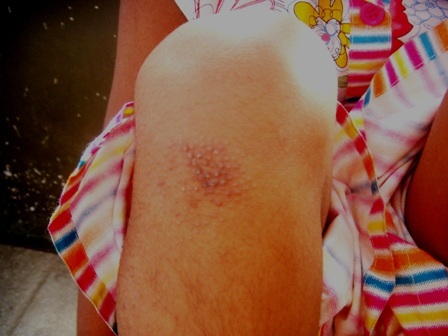 A 14 year old male child presented in the Dermatology outpatient department of Government Medical College, Amritsar with skin lesions distributed asymmetrically over exposed areas of arms and legs in the form of multiple itchy papules with keratotic surface, coalescing at places to form plaques (Fig 1,2). There was a history of contact with soil and contaminated water as the child used to play outdoor cricket with his friends and at times he had to take out the ball from drains. In an attempt to get rid of these lesions, patient used to scrub the lesions with pumice stones. 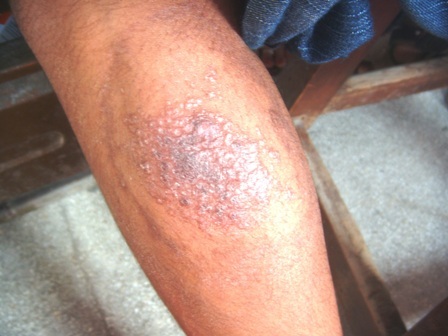 Fig 1: Lesions over the extensor aspect of left arm are in the form of multiple skin coloured papules arranged in a circular pattern coalescing to form plaques on an erythematous base. Secondary eczematization is seen. Few satellite papules are present. Fig 2: Lesions over the right infrapatellar region shows multiple hyperpigmented follicular papules arranged in a circular pattern. Atypical mycobacterial diseases, chromoblastomycosis, foreign body reaction, sarcoidosis, keratotic disorders were kept in the differentials. Hematological profile (Hb12.5g/dl, total leukocytic count 9800/cu mm, differential leukocytic count: neutrophils 66/ lymphocytes 42/ eosinophils 02/ monocytes 02, ESR14mm, PBF showed normocytic normochromic anemia) and urine examination were normal. Antibodies against HIV were not detected and Mantoux test was normal. Radiographs of chest & hands were normal. 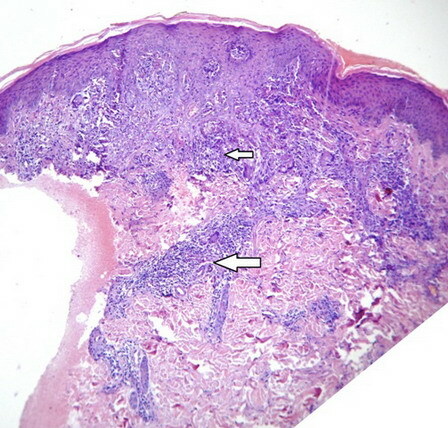 Fig 3: Acanthosis, orthohyperkeratosis plasma exudation, superficial and deep perivascular infiltrate mainly composed of lymphocytes, plasma cells and giant cells. In giant cells prototheca species were seen under low magnification. 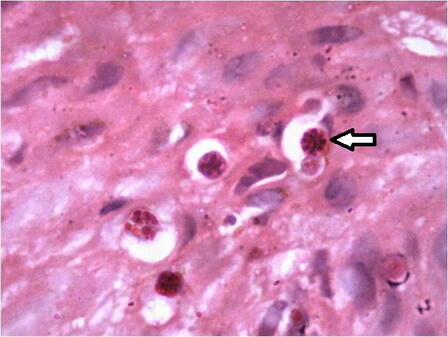 Fig 4: Basophilic spherules of prototheca are seen (40X). Fig 5: Light basophilic spherules of prototheca seen under oil immersion. Fig 6: Transepidermal elimination of eosinophilic spherules of prototheca is seen (oil immersion). Culture: After incubation for 48 hours on sabouraud's dextrose agar at 28°C and 37°C, smooth creamy white moist colonies were obtained. Further subcultures and biochemical tests could not be performed due to bacterial contamination of the culture. Patient was put on Itraconazole 200mg/ day for 20 days and he showed significant improvement. After this, the patient became irregular and was subsequently lost to follow up. To the best of our knowledge, the disease is extremely rare in humans as only few hundred cases have been reported throughout the world and only one case has been reported from India (Pubmed, Medline, Cochrane library, Medscape). Even the case reported in India was in a child with lowered immunity and having disseminated disease with no response to Amphotericin B. Our case is being reported due to its presentation in a healthy immunocompetent child. Through our case report, we want to emphasize the need to diagnose this infection in early stage in order to prevent dissemination. Also, high index of suspicion should be kept in recurrent and nonresponsive cases with similar presentation. 1. Lass-Florl C, Mayr A. Human protothecosis. Clin Microbiol Rev. 2007;20(2):230-42. 2. Davies R, Spencer H,Wakelin P. A case of human protothecosis. Trans.R.Soc.Trop.Med.Hyg. 1964;58:448-51. 3. Leimann B, Monteiro P, Lazera M, Candanoza E and Wanke B. Protothecosis. Med. Mycol. 2004;42:106. 4. Mathew LG, Pulimood S, Thomas M, et al. Disseminated protothecosis. Indian J Pediatr 2010 Feb; 77(2):198-9. 5. Woolrich A, Koestenblatt E, Don P, Szaniawski W. Cutaneous protothecosis and AIDS.J Am Acad Dermatol 1994;31:920-24. 6. Torres HA, Bodey GP, Tarrand JJ, Kontoyiannis DP. Protothecosis in patients with cancer: case series and literature review. Clin Microbiol Infect 2003;9:786-92. 7. 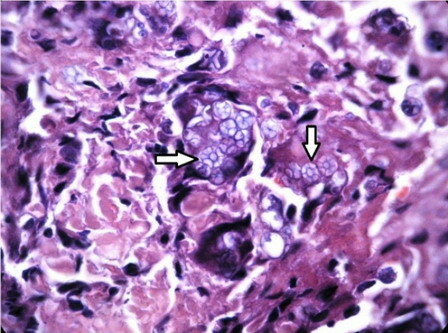 Wirth F, Passalacqua J, Kao G. Disseminated cutaneous protothecosis in an immunocompromised host: a case report and literature review. Cutis 1999;63:185-88. 8. Pore S, Barnett E, Barnes W, Walker J. Prototheca ecology. Mycopathologia 1983;81:49-62. 9. Nelson A, Neafie R, Connor D. Cutaneous protothecosis and chlorellosis, extraordinary "aquatic borne" algal infections. Clin Dermatol 1987;5:76-87. 10. Casal M, Solis F. First isolation of Prototheca species in Spain. Mycopatologia 1981;74:55-6. 11. 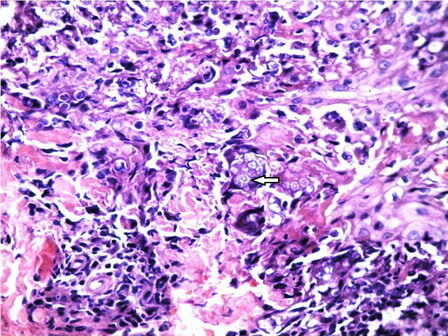 McAnally T, Parry E. Cutaneous protothecosis presenting as recurrent chromomycosis. Arch Dermatol 1985;121:1066-69. 12. Kantrow S, Boyd A. Protothecosis. Derm Clin 2003;21:249-55.